Wyden honors late sailor, answers health care, immigration questions and future of U.S.
U.S. Sen. Ron Wyden's Friday Town Hall in Sherwood not only provided a chance to answer questions about the federal government shutdown, immigration and healthcare but was also a chance to honor the memory of a World War II U.S. Navy veteran to lose his life more than 76 years ago. At the beginning of the meeting at Sherwood Center for the Arts, Wyden talked about Vernon Garner, who died aboard the USS Pensacola on Nov. 29, 1942, when a Japanese torpedo struck the ship, killing 118 men aboard. 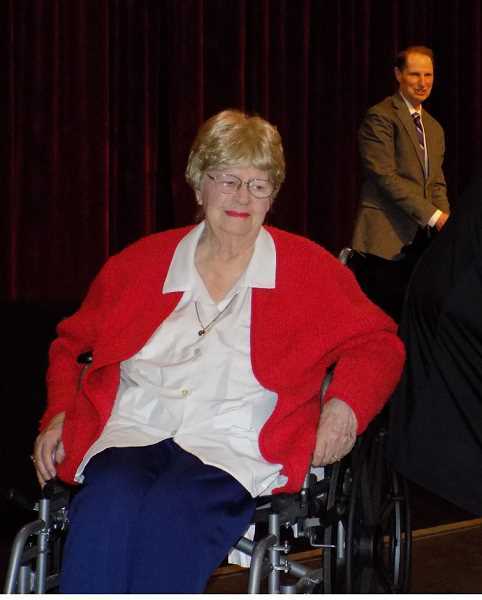 "He perished at sea in service to our wonderful country," Wyden said before presenting Garner's widow, June Close, of Sherwood, with commendations including a Purple Heart, Combat Action Ribbon, World War II Victory Medal, the American Defense Service Medal and others, along with an American flag. "Thank you for this great honor," an emotional Close told those gathered. "I really appreciate it." Wyden was introduced by Sherwood Mayor Keith Mays to an almost full crowd at the arts center. 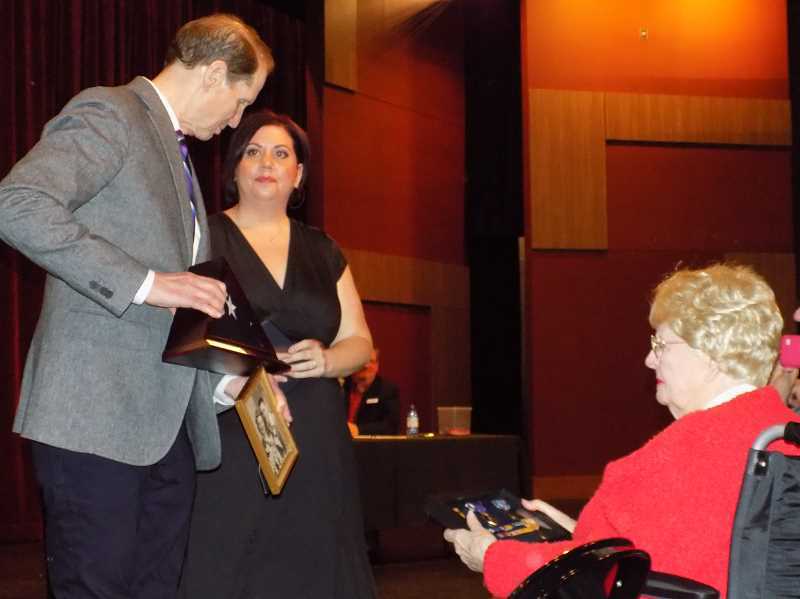 For Wyden, it was his 915th Town Hall, having been recognized that same day with an award from the Town Hall Project, who gave the senator its "Senate VIP" Award. The project pushes legislators to have face-to-face conversations with their constituents and tracks all congressional town hall events. During the event, Wyden, who belongs to both the Senate Committee on Finance and the Intelligence Committee, told the audience that America spends $3.5 trillion on medical services each year, enough money to send a check for $40,000 to every family in America. "We're not spending it in the right places," said Wyden, a member of the U.S. Senate since 1996. He then polled the audience of mostly supportive Wyden fans (some of whom had healthcare advocate shirts on) – to near-unanimous approval – on such issues as to whether they believe health care is a basic human right, whether there should be universal coverage in America and whether health care should be even bolder. Wyden said for the short term, Congress needs to hold down the cost of prescription drugs, blaming middlemen involved in the pharmaceutical industry as part of the problem. In addition, Wyden said Medicaid costs must be held down. "If you think like I do, health care is a basic human right," said Wyden. Responding to a comment that there is no oversight for those providing health care, Wyden said he is pushing for more oversight especially in the pharmaceutical realm. He pointed to a the fact there has been bi-partisan support for reducing costs of the EpiPen, a epinephrine auto-injector used to treat severe allergic reactions, whose price tag has skyrocketed exponentially over the years. A recently retired teacher from Beaverton, who said she objected to the current administration, saying that "I cannot, cannot, listen to that man's voice," and asked the senator for three examples to make her confident In the future of the U.S. system of government. Wyden said he likes to quote Abba Eban, an Israeli politician and diplomat, who said, "'The Americans always get it right' and then he paused, 'after they try everything else'" before listing several issues of which to be hopeful about. Wyden said he felt it will be difficult for the government to reopen if there's a president who has a closed mind. While Wyden is pretty much against building a southern wall, he said he supports security of borders and has voted for billions of dollars for border security involving technology and fortified fencing. On the special council investigation on Russian interference during the last presidential election, Wyden said former FBI director Robert Mueller is investigating the possible criminal side of the issue while the Senate Intelligence Committee is hoping to tell the story of how the Russians attacked us. Wyden said there is no better way than to follow the money and said he has reintroduced a proposal requiring the president disclose his federal income taxes. In response to a woman who asked him to support funding for those suffering from mental illness, Wyden said the issue hits close to home, having a brother who suffers from schizophrenia. Wyden pointed out he is pushing for a single, targeted 3-digit phone number where those contemplating suicide can dial to reach a Behavioral Health and Suicide Crisis Lifeline. Told a mother who's a member of Moms Demand Action for Gun Sense, a group whose website says it's dedicated to protecting people from gun violence, that he wants to ensure that loophole-free, background check legislation is eventually passed in Congress. 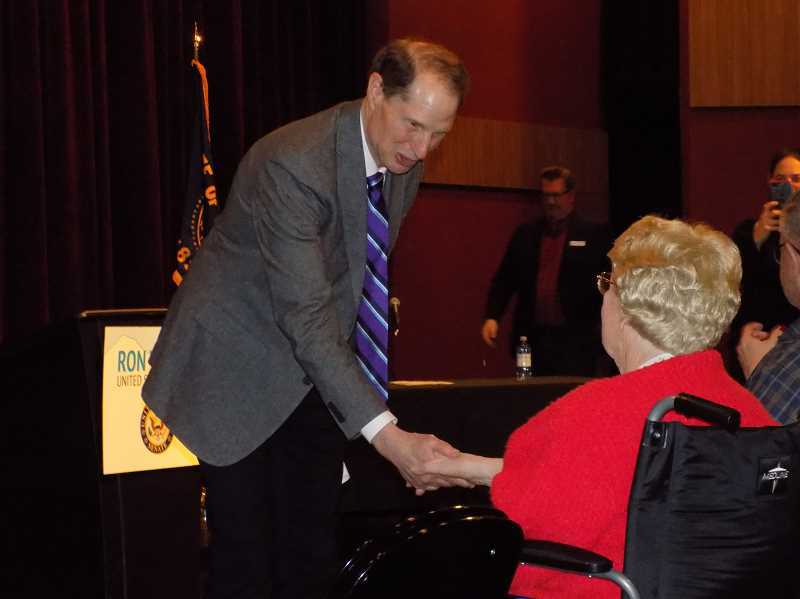 During U.S. Sen. Ron Wyden's visit to the Sherwood Center for the Arts Jan. 4, Sherwood resident Aimee Heath told the story of how her grandmother, June Close, met her first husband, the late Vernon Garner, a sailor who was killed during World War II. Garner was honored with posthumous medals and an American flag presented to Close by Wyden. A more-than-25-year Sherwood resident, Close met Garner in Long Beach, Calif., in the late 1930s and liked him right away, finding him "sweet, caring and wonderful." The two would marry on Sept. 3, 1941, when she was 17 years old, according to information supplied by Heath. Close, now 95, and Garner honeymooned for seven days before he had to return to his ship, the USS Pensacola, on the eighth day. After several battles, the cruiser, nicknamed the Grey Ghost by the Japanese, was involved in the Battle of Tassafaronga where American ships had intercepted a Japanese destroyer/transport fleet. Tragically on Nov. 29, 1942, a Japanese torpedo ruptured the ship's oil tank, which in turn caused the ammunition to explode, killing Garner and 117 other men along with seven officers. Also aboard that ship was Garner's best friend, James Close Sr., one of only two men to survive the torpedo attack on the USS Pensacola. The two would marry in 1943 and raise four children. "I have the privilege of being her granddaughter," Heath said, "and through the years, learning of the legacy and the love that Vernon left behind for his sweet life."